Graeme Lowe and co-workers have recently published an article describing a new genus and and a new species i the family Buthidae from the Arabian Peninsula. A second species is transferred to the new genus. Trypanothacus Lowe, Kovarik, Stockmann & Stahlavsky, 2019 - New genus from Saudi Arabia and Oman. 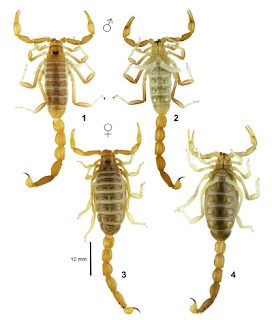 Trypanothacus barnesi Lowe, Kovarik, Stockmann & Stahlavsky, 2019 - New species from Oman. Trypanothacus buettikeri (Hendrixson, 2006) - New combination. Previously name Buthacus buettikeri Hendrixson, 2006. We define a new fossorial buthid genus Trypanothacus gen. n., similar to Buthacus Birula, 1908, differing primarily in telson shape, with a bulbous vesicle and aculeus shorter than the vesicle, and in heavier dentition on metasomal segments II–III and IV. The new genus includes two species: T. barnesi sp. n. from Oman and T. buettikeri (Hendrixson, 2006) comb. n. from Saudi Arabia, the latter transferred from Buthacus. We provide detailed illustrations of both species from preserved materials, and in vivo habitus and natural habitat are shown for T. barnesi sp. n.. Information is also provided on ecology and captive rearing of T. barnesi sp. n., and on its karyotype (2n=26). The new genus is compared to genera Buthacus and Vachoniolus Levy et al., 1973. Telson morphology of these genera is analyzed and compared with other psammophilous and pelophilous buthids. In certain subgroups of scorpions, we find that aculeus length can be related to psammophily and body size. As a highly diverse multifunctional organ, the telson is shaped by complex environmental and genetic factors. We propose that telson morphology can nevertheless be useful for taxonomy if it is carefully applied.